I'm a big fan of chicken salad. I mean, a really big fan. It's just so good! It's creamy, it's full of so many different flavors and it can be made in so many different ways. I always hope that there's leftovers when I make dinner so I can chop it up the next day for a quick, yummy sandwich. If there isn't any, I'll just cook up a couple boneless, skinless chicken breasts to get my fix. You might be thinking, "Chicken salad is just so bad for you." Well, you'd be correct. In fact, if you look at chicken salad at a restaurant, you can bet it's one of the worst things on the menu. I don't like that heavy, horrible for you mayo dressing on chicken salad either, so I came up with this lighter version that is just as tasty as the not-so-good-for-you one. Light sour cream is used in place of some of the mayo and apple cider vinegar gives a natural sweetness. I love this version because it's so easy to make and the extra add-ins can be whatever you have on hand or whatever you're craving at the moment. I personally like to add fruit - dried or fresh - along with the standards like onion and celery. The fruit brings a healthy, sweet flavor and texture that is such a great compliment to the other ingredients. You can use this recipe as a base and then add your own 'extras' to suit your own tastes. 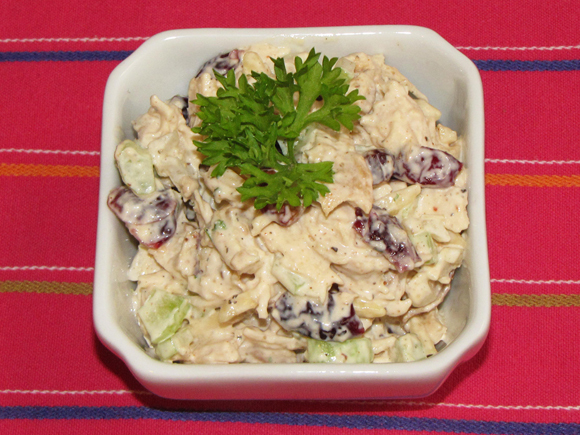 The possibilities are endless when it comes to chicken salad add-ins! What do you put in yours? 1. Shred or dice chicken into small pieces. 2. Mix dressing ingredients together and toss with chicken. 3. Add your 'extras' then chill for about a half hour in the refrigerator.